Exactly one week ago, I got myself a super minion size of Ethereum (SGD100 to be exact), you can read here for my earlier post. 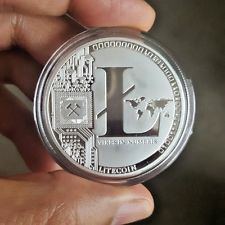 This week, I've gotten my second cryptocurrency - Litecoin , another minion size (SGD150) due to the limit imposed by the exchange. What is Litecoin? As at today, Litecoin is the 5th biggest Cryptocurrency in the market (after Bitcoin, Ethereum, Bitcoin Cash and Ripple). In terms of the market cap. Litecoin is sitting at USD $3.8+ billions. It was launched 6 years ago by a former Google employee, Charlie Lee. Litecoin is quite similar to Bitcoin except for some technical differences which make it about 4 times faster than Bitcoin (in terms of transaction speed). Personally, I am not into trading, the high volatility of the crypto market and high commission rate make it less advantage to do so. I will just slowly accumulate a few of such alternate "assets" for the long haul. Also, I make sure that these are the casino money (a term from an article I read i.e. money that I prepared to lose all). Note: This is just to share my fun (hopefully) cryptocurrency journey and by no means to encourage my reader to go into such investment/trading.